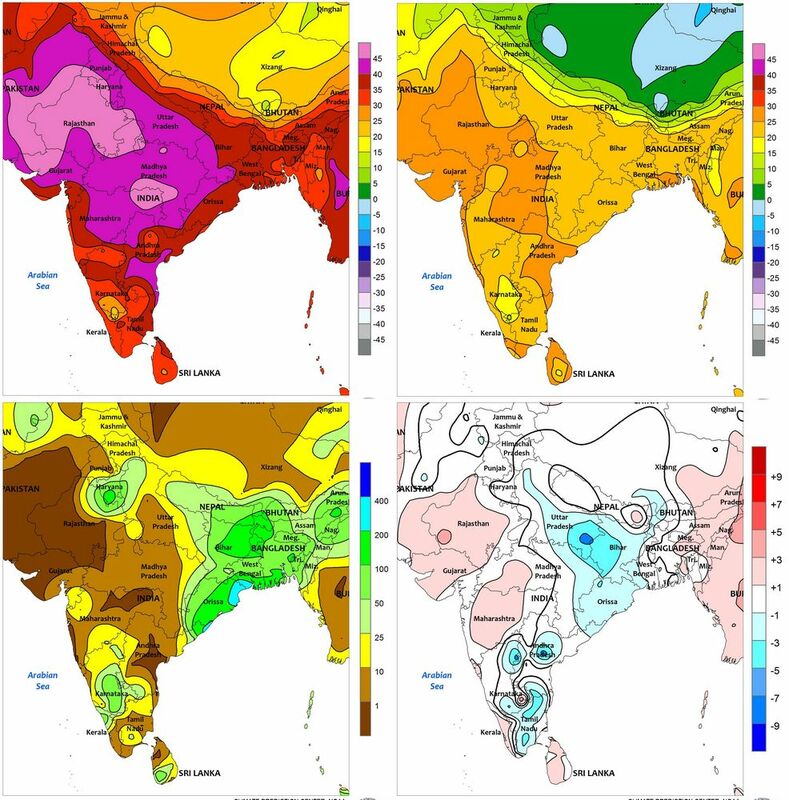 The India Meteorological Department has just released it’s long-awaited forecast for the 2015 Indian monsoon. In terms of the quantity of rainfall over the duration of the monsoon season (June to September) the IMD has said it will be 93% of the ‘Long Period Average’. 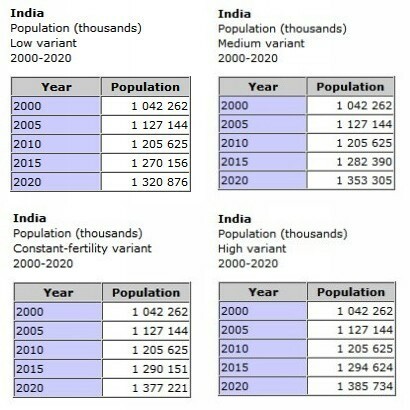 This average is based on the years 1951-2000. What this means is the ‘national’ average rainfall over the monsoon season for India is considered to be 89 centimetres, or 890 millimetres. So, based on the conditions calculated till today, the ‘national’ average rainfall for the June to September monsoon season is likely to be 830 millimetres. There are caveats and conditions. The first is that the 93% forecast is to be applied to the long period average for each of the 36 meteorological sub-divisions, and a ‘national average’ does not in fact have much meaning without considerable localisation. The second is that the forecasting methodology itself comes with a plus-minus caution. There is “a model error of ± 5%” is the IMD’s caution. 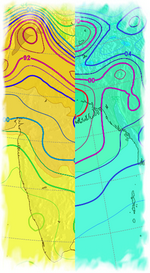 This first forecast and the model that the forecast percentage has emerged from are thanks to the efforts of the Earth System Science Organization (ESSO), under the Ministry of Earth Sciences (MoES), and the India Meteorological Department (IMD), which is the principal government agency in all matters relating to meteorology. This is what the IMD calls a first-stage forecast. This is a lower figure than the 93% headline issued by the IMD. This too should be read with care as there are five “category probability forecasts” that are calculated – deficient, below normal, normal, above normal and excess. Each is accompanied by a forecast probability and a climatological probability (see the table). The maximum forecast probability of 35% is for a below normal monsoon, while the maximum climatological probability is for a normal monsoon. Ignoring the torpor of the summer heat, the India Meteorological Department has dusted off the statutory paragraphs that give us in the sub-continent a first indication of what monsoon for the year may be like. The result this year, both scintillating pages, has been made that much more gripping by the inclusion of El Niño. 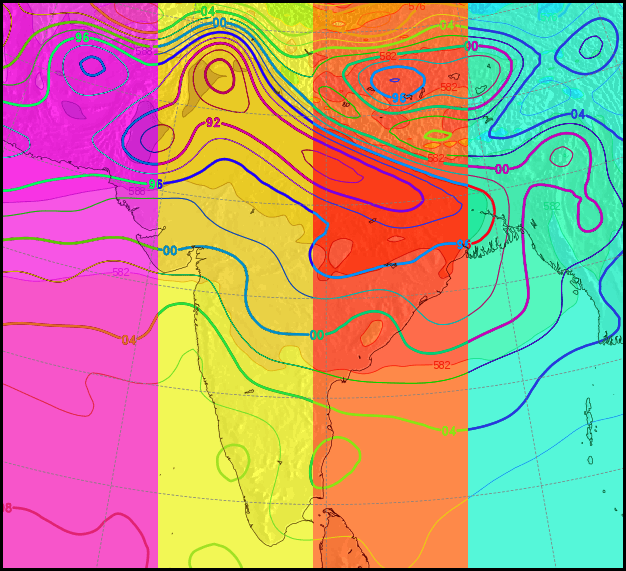 The IMD’s treatment of the normal variables whose interplay determine the nature of any monsoon is perfunctory – which is surprising as the regional and international earth observation networks spare no detail and tend to inundate us with data and analysis. Clouds and wind, land and farm. The equation that all rural districts make at this time of the year, but which is becoming more difficult with every year that climate change strengthens its grip. But the IMD, especially for the south-west monsoon, has always preferred to be spartan. Perhaps there is some philosophical dictum that us non-meteorologists have yet to grasp, and if so then the only criticism we may be permitted, if the IMD had its way, its to ask for more such teaching. But the IMD does not have its way, and we publics whose monies support its work must continue to demand from the recalcitrant department better, much better, application and communication of its work. I think this proves how out of step the IMD – and the Ministry of Earth Sciences (grand title isn’t it?) – is with what citizens of India experience in their villages, towns, fields and hills. For, the south-west monsoon no longer arrives in the first week of June, and it no longer begins to depart by mid-September. Climate change began to alter that comfortable rhythm years ago, but the IMD’s forecasting grindstone is the same, never mind how many new earth observation satellites India pelts into orbit. With all these provisos, stated and implicit, what has the IMD told us? First, that the “experimental ensemble forecast based on IMD seasonal forecast model (SFM) indicates that the rainfall during the 2014 monsoon season (June to September) averaged over the country as a whole is likely to be 88% ± 5% of long period average (LPA)”. This means that in places it could be as low as 83% of the average, and no more than 92% of the average. Combine this with the assessments about the 2014 El Niño and we can see why, far from being satisfied that the IMD is considering both the monsoon and El Niño, we ought to monitor independently both and force the IMD to become more responsive. 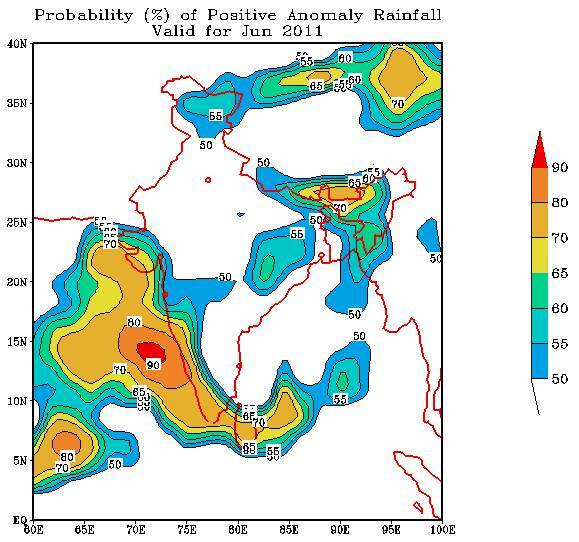 Second, that “the experimental forecast based on the coupled dynamical model forecasting system suggest that the monsoon rainfall during the 2014 monsoon season (June to September) averaged over the country as a whole is likely to be 96% ± 5% of long period model average (LPMA)”. This is a more hopeful set, but also shows that the IMD, by telling us of two different scenarios from two models, is hedging its forecast, which is not what its job is. 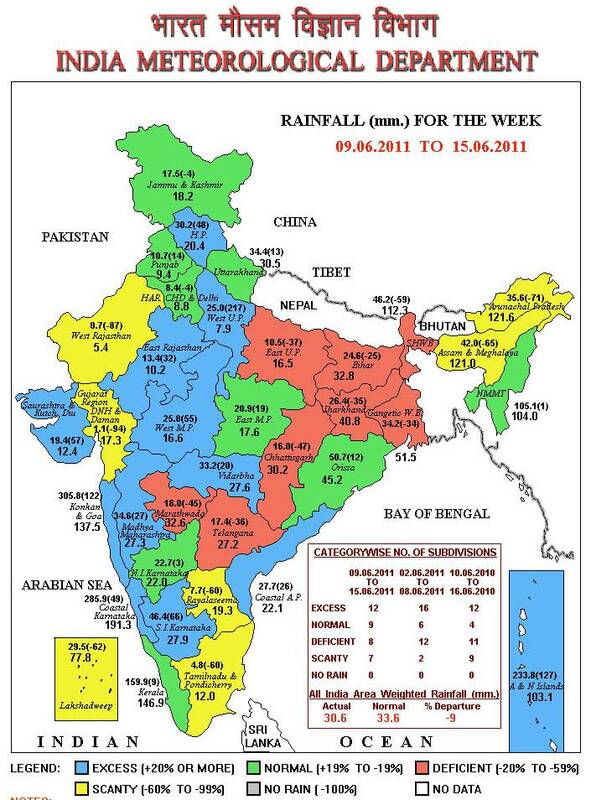 Third, the IMD has said “the experimental five category probability forecasts for the 2014 monsoon season rainfall over the country as a whole using the experimental dynamical prediction system are 33% (deficient), 20% (below normal), 24% (normal), 6% (above normal) and 17% (excess)”. 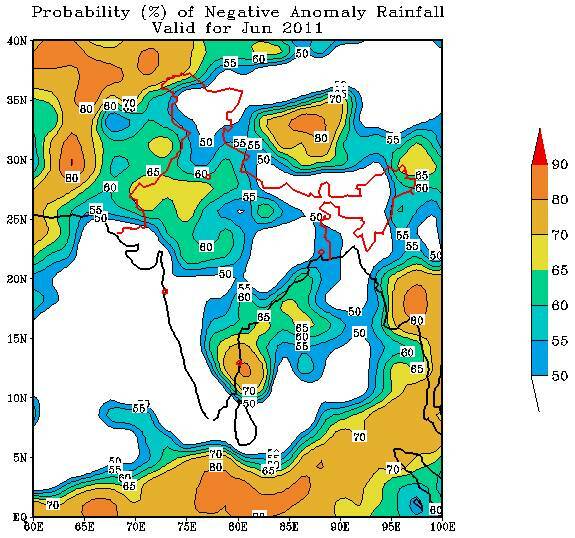 This means, using this ‘probability’, that a normal monsoon for 2014 has only a 1-in-4 chance whereas a deficient monsoon (that is, total rain less than 90% of the long period average) has a 1-in-3 chance. This is a prognosis that stands between serious and grim, for a 10% drift towards the lower side of an expected average, for any of our 36 agro-meteorological regions, can spell ruin for farmers and severe hardship for water consumers. 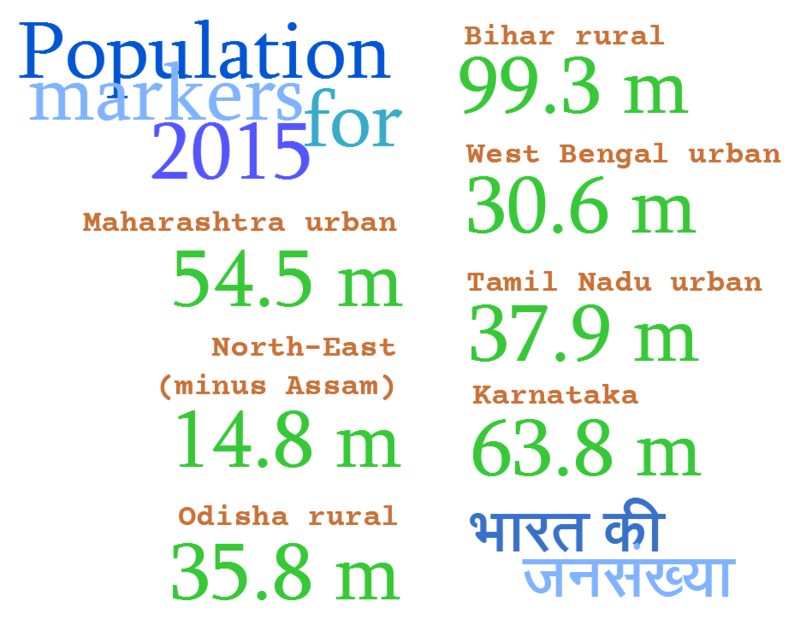 How have central and state governments prepared for such a forecast? We have no information, most likely because there has been no preparation (there are contingency plans for the chronically drought-prone districts, but these are normally triggered when there is an official declaration by the state government that there are conditions of drought in parts of the state). Elections or no elections, El Niño cares not, and it is up to the state governments to make preparations for a monsoon 2014 whose delivery of water already looks uncertain. 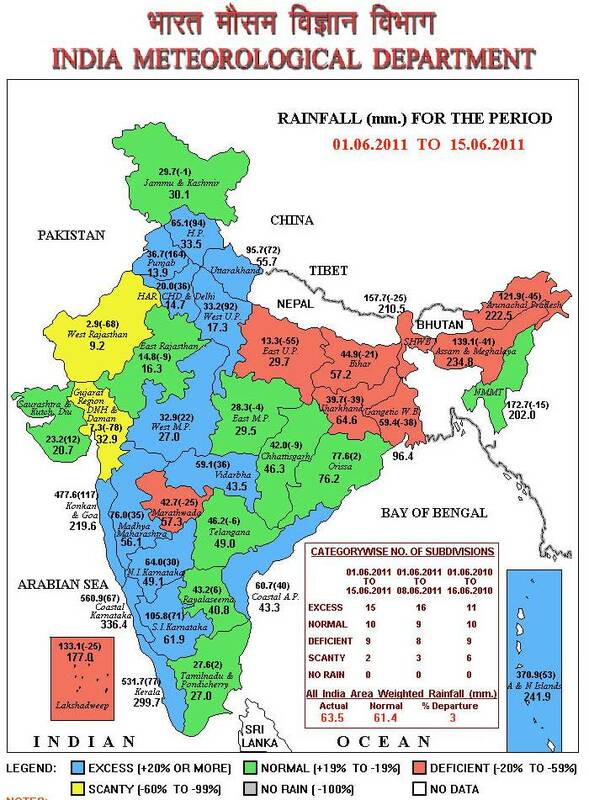 Rainfall averages for the months of January to August 2013, nicely arranged in one handy panel. June, July and August 2013 are behind us and India’s understanding of the south-west monsoon – and also of climate change during monsoon and outside the monsoon months – has scarcely improved. Other than the announcements from the Indian Meteorological Department, which are unintelligible to anyone with even the smallest interest in monsoon and climate, there is little in India’s media or from official sources that helps turn an embarrassing scarcity of understanding into knowledge. The IMD, I was told about two years ago by a senior crop scientist, is queried every day by officious underlings from New Delhi wanting to know weather conditions for wherever their bosses are to visit, and this means the ministers of the cabinet, sundry senior and junior ministers, all variety of politicians and all their scheming cronies and hangers-on. 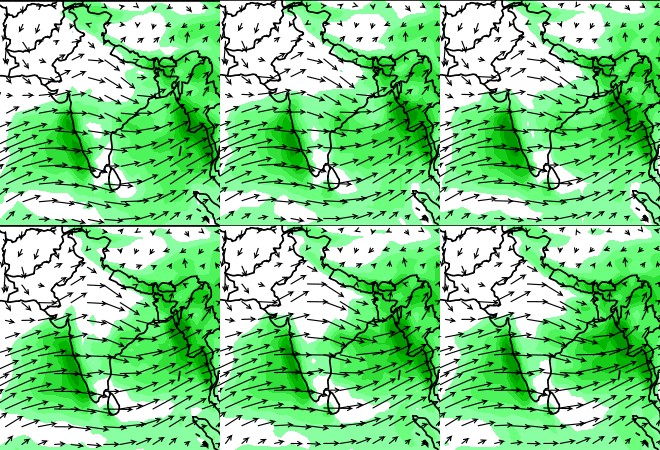 That is why the IMD has so many special forecasts for New Delhi on its website. 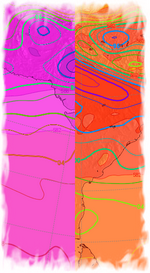 For the Indian Meteorological Department, India outside Delhi seems to be an annoyance. There are science institutes, such as the Indian Institute of Tropical Meteorology, which is, as far as I can make out, the seat of the scientific inquiry into monsoon and climate. The communication about its work however is either dismal or absurdly comic. Scientists long ago realised that to be of use to society, they had to make their questions and answers understood by those whom they wish to serve. In such a spirit, India’s monsoon and climate scientists and researchers ought to have begun their careers with a session before their grandmothers – could they explain their work to their grandmothers? If not, they ought not to have been accepted in their present jobs (and their grandmothers should be inducted instead, for the wealth of their traditional knowledge). Can the Director General of Meteorology – who is the head of the IMD – explain this to his washerman, his gardener and the chap who sells him vegetables? If not, he ought to make way for someone who can, because India understands the DG of M not at all, and we’re not paying his salary and departmental budget from our taxes to be misspoken to about the rain. Just so that you know, this verbally challenged gentleman is assisted in his duties by five Additional Directors General and by 20 Deputy Directors General. And when I examined where this chatty group is deployed, the Delhi obsession (or fear thereof) became immediately clear, for of the five Additionals, four are in Delhi (the fifth is in Pune), and of the 20 Deputies, ten are in Delhi (the others are over the capital’s horizon, toiling somewhere in the torpor of the sub-continent. The IMD runs six regional meteorological centres – each ruled by a humourless Deputy Director General, all morbid conversationalists – and these are to be found at Mumbai, Chennai, New Delhi, Kolkata, Nagpur and Guwahati. Then the IMD has what it importantly calls ‘operational units’: meteorological centres at state capitals, forecasting offices, agro-meteorological advisory service centres, flood meteorological offices, area cyclone warning centres and cyclone warning centres. All important centres, all equally incoherent about their work, all equally clueless about how to speak simply with those who need the forecasts the most. What will it take to get these scientists and researchers to understand that monsoon, rain, weather and climate are of great interest to most adults amongst the country’s 1.25 billion-strong population, and that by mumbling only to each other in equations and formulae they continue to do us a mis-service, and in fact shirk their main duty? 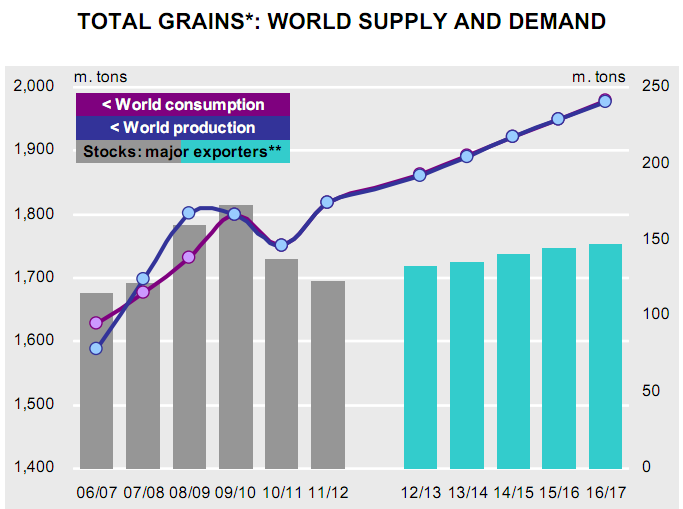 The world 2012-13 total grains harvest (wheat and coarse grains) forecast has been revised lower by the International Grains Council (IGC) to 1,810 million tons (mt) this month and is now expected to fall year-on-year. The IGC’s forecast for the US maize crop has been cut by 50 mt, to 300 mt and the soyabean harvest has been reduced by 8.3 mt to 79 mt. Wheat output has also been revised lower in both Kazakhstan and Russia. Maize (corn) and soyabean prices have soared to new highs on deteriorating output prospects in the US following the worst drought since 1956. 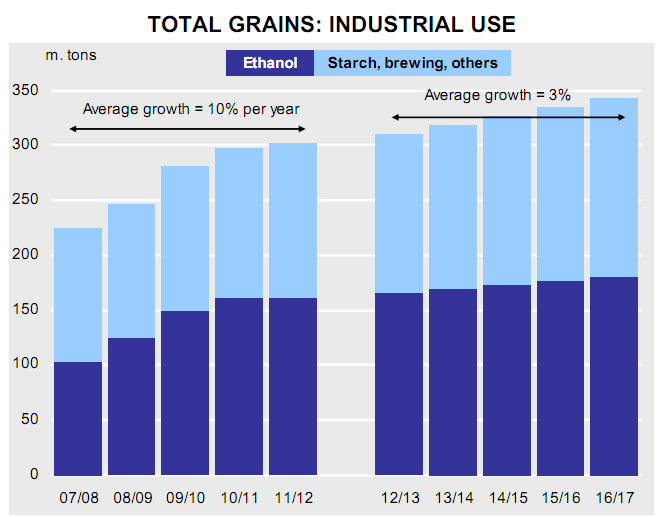 Unfavourable weather conditions have also led to a scaling back of grains output and exportable surpluses in the Black Sea region, supporting gains in wheat and barley values. 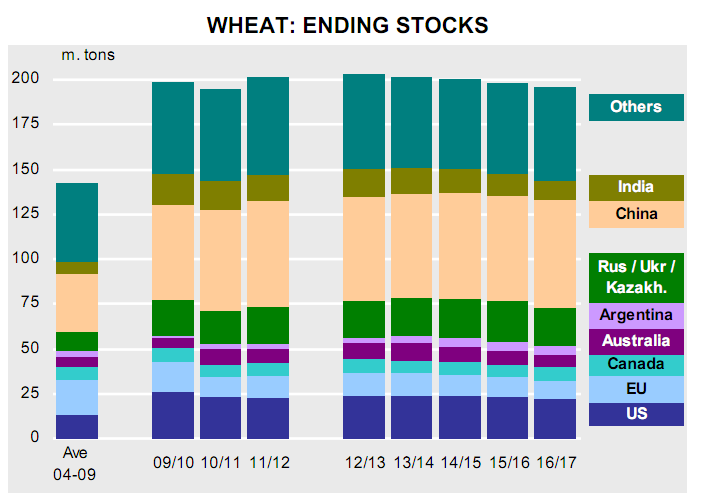 Global carryover grains stocks are expected to fall by 29 mt by the end of 2012-13, led by a 15 mt drop in wheat and 14 mt fall in maize; maize stocks are forecast at a six-year low. Agrimoney has said that the downgrade takes the council’s estimate for the US corn harvest well below the US Department of Agriculture’s own forecast, of 329.5m tonnes. The USDA, whose estimates are followed particularly closely by traders, also still foresees a small rise in world corn inventories. However, analysts have already started the countdown to the next USDA Wasde report, on August 10, when it will revise estimates for crops worldwide. The IGC Grains and Oilseeds Index (GOI) reached an all-time high on 20 July, and, despite some recent easing, is still up 14% month-on-month (m/m). World soyabean production is expected to recover sharply in 2012-13, rising by some 9% year-on-year, although the forecast hinges on a strong rebound in output from South America where planting begins in the fourth quarter of 2012. Rice output in 2012-13 is forecast up 1%, compared to 3% growth in the previous year, due to less rapid expansion in Asia, but consumption growth is also likely to be lower. 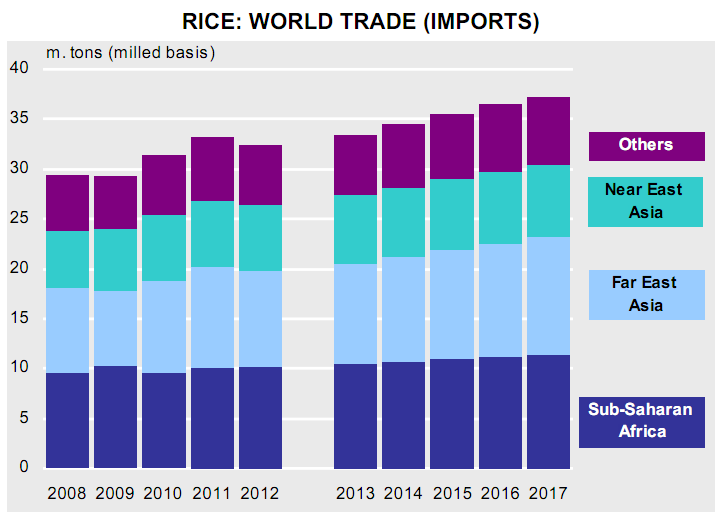 In contrast to the steep weather-driven gains in grains and oilseeds markets, rice prices declined marginally, mainly on supply-side pressures in Thailand.